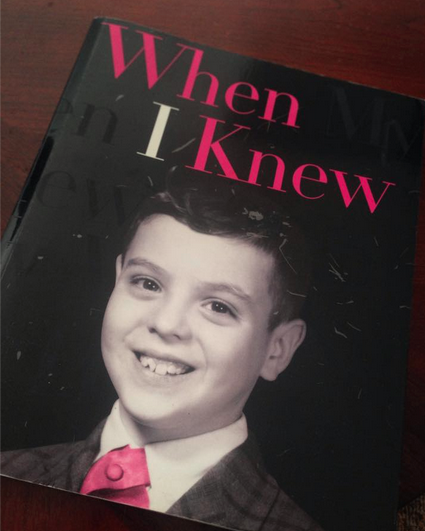 the “when i knew” project. This summer, during a weekend trip to the city of Portland, I passed the wait for a city bus by visiting Powell’s Bookstore, whose shelves are comprised of new and used books. Shuffling through them, I stumbled upon a book called When I Knew. Comprised of a collection of narratives from lesbian, gay, and bisexual people sharing their “moments of knowing,” When I Knew features stories running the gamut from funny to absurd to heartbreaking to victorious. Each of the narratives, I found, was perfectly human and real. The project spoke to us both; I bought the book, and we had to run for the bus. Now it sits on my coffee table, and more than one guest has rifled through it with curious energy. There is power to our stories. I have said this and will say this again and again. And so begins my own small version of this project: The “When I Knew” Project. Friends and social media acquaintances have begun sharing their “moments of knowing,” and I will publish these – anonymously – here on this blog. Feel free to read and peruse them, perhaps to better understand and empathize or perhaps to feel not alone. For we are not alone, and that is the saving power of sharing stories.